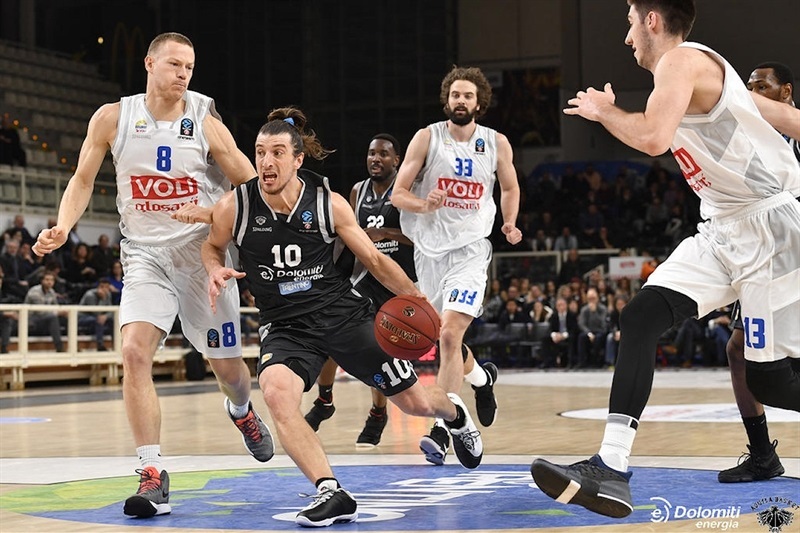 Danilo Nikolic hit a pair of free throws with one-tenth of a second to go to lift Buducnost VOLI Podgorica to a double-overtime 105-106 victory over Dolomiti Energia Trento and into the EuroCup Quarterfinals for the first time in five years. 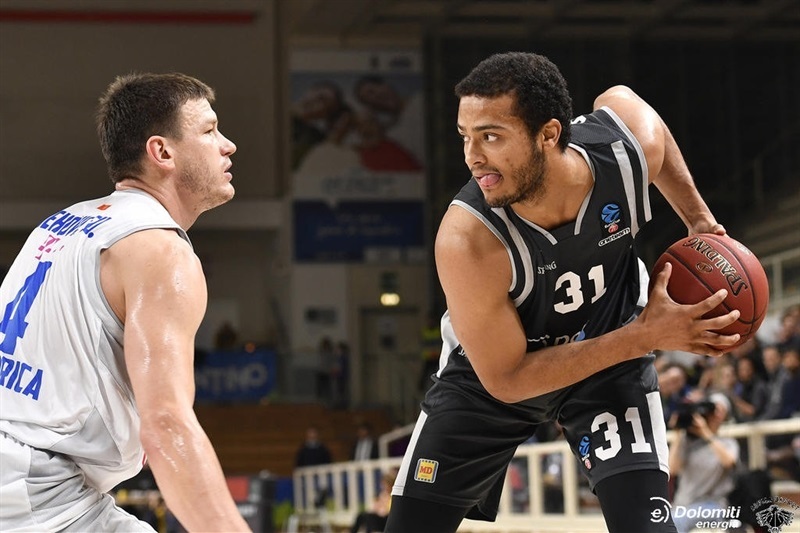 Buducnost needed to wait a long while after its own game to learn its fate, but when Lokomotiv Kuban Krasnodar completed its victory over Cedevita Zagreb, both Lokomotiv and Buducnost were ensured tickets to the next stage. 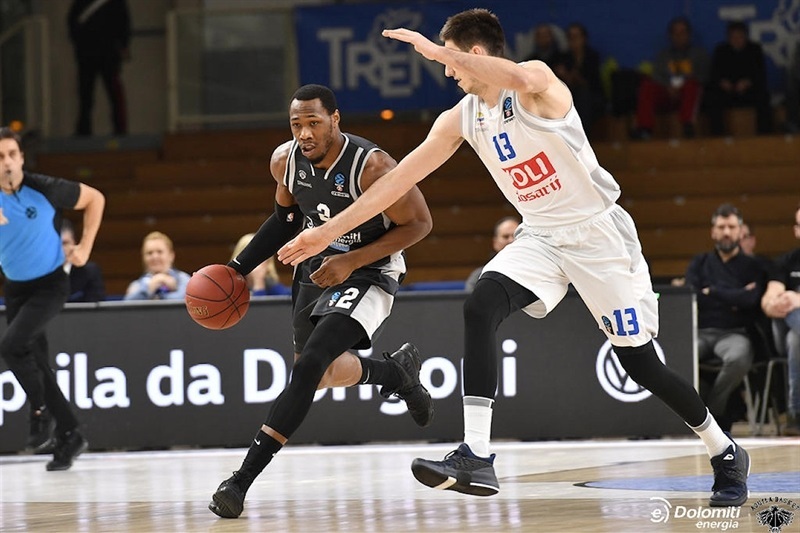 Buducnost won its third straight game to improve to 3-1 in Group G, while knocking Trento to 2-1 and ending its chances of advancing. Buducnost set a club record for scoring and came within 1 of the team-high for three-pointers with 14. Nemanja Gordic led the way with a career-high 23 points plus 7 assists, Nikola Ivanovic scored 20, Danilo Nikolic tied his career-best with 15, Kyle Gibson added 12 and Suad Sehovic 10. Toto Forray scored a career-high 24 for Trento before fouling out. Dominique Sutton posted 15 points, 11 rebounds and 6 assists, Dustin Hogue tallied 15 points and 10 boards and Jorge Gutierrez scored 13, but all three also finished the game on the bench with 5 fouls. Shavon Shields netted 16 and Beto Gomes 11 in defeat. 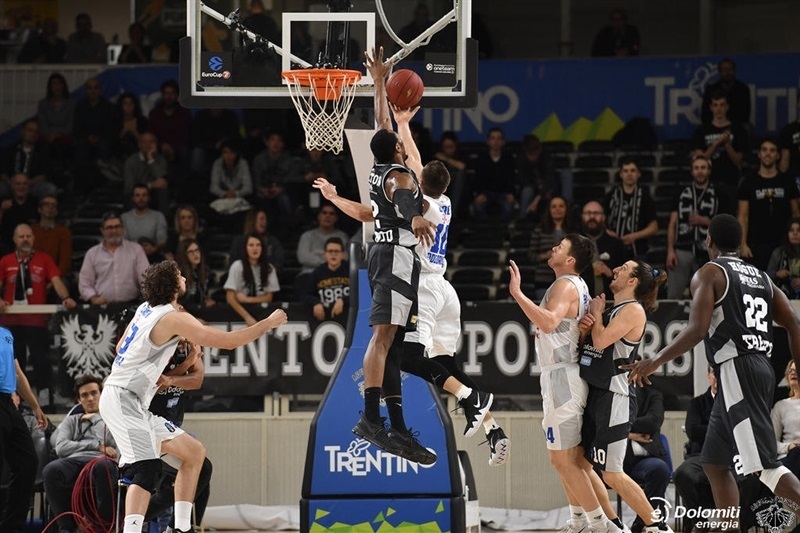 Trento used a 17-0 third-quarter run to take charge and led by as many as 9, but Buducnost used some hot shooting in the fourth quarter to come back and set up what became a 50-minute thriller. 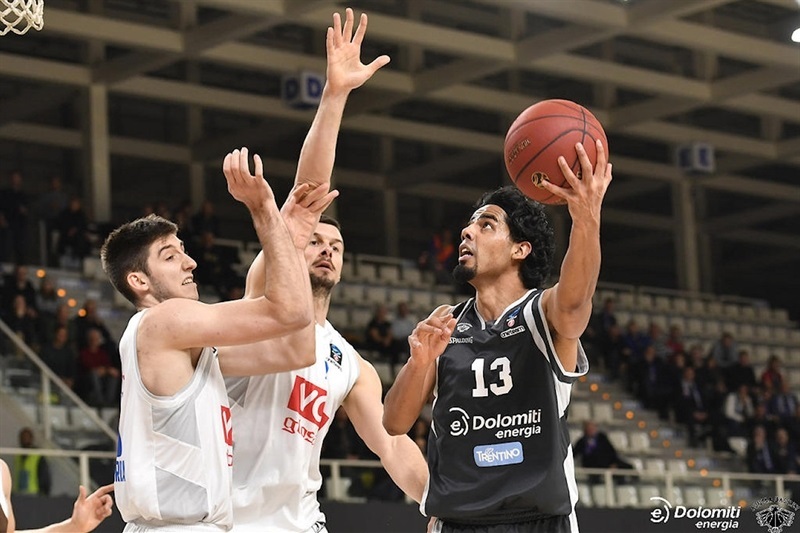 Three-pointers by Gibson and Suad Sehovic gave the visitors a 2-6 start, but Gutierrez came alive with 7 straight points and Forray added a three-pointer in a 10-0 Trento run. Free throws by Suad Sehovic and Zoran Nikolic kept Buducnost close, 14-11. The visitors continued their comeback and after a second three by Gibson and a Gordic jumper, the score was even at 18-18. Hogue pushed Trento back ahead with a free throw and the lead changed hands twice more with Ojars Silins’s triple leaving the hosts ahead 22-20 after 10 minutes. Buducnost took charge with a Filip Barovic layup and Justin Doellman three-pointer highlighting a 0-8 start to the second quarter. Even when Trento got going again, a Ivanovic triple and Barovic basket inside kept Buducnost in control at 29-34.The hall was silent after a Danilo Nikolic jumper extended the margin to 7 but a three by Forray, put-back-plus foul by Hogue and Shields triples brought Trento back to even the score, 37-37. Gordic sank a pair of free throws and a three-pointer to give Buducnost a 41-46 halftime advantage. Buducnost looked to pull away early in the second half when Aleksa Ilic twice pushed the lead to 8. 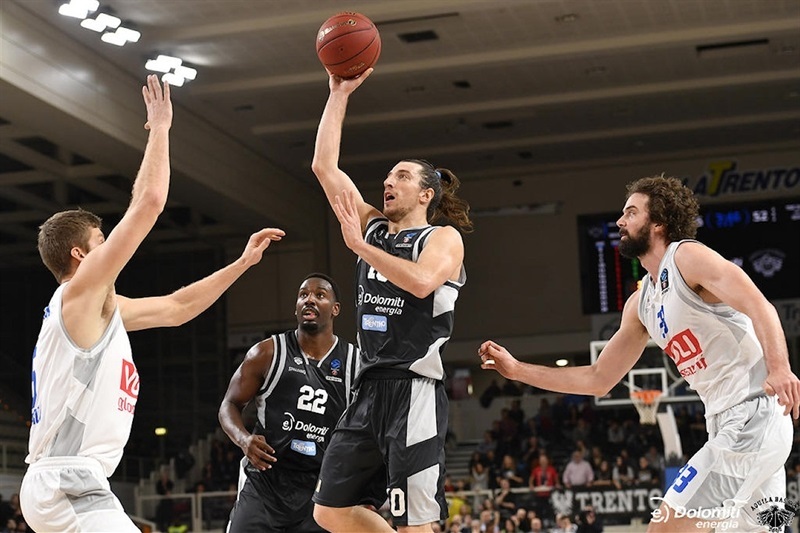 However, Shields started what became a 17-0 run, in which Hogue had 5 points, 5 rebounds and 1 steal to put Trento in control 61-52. 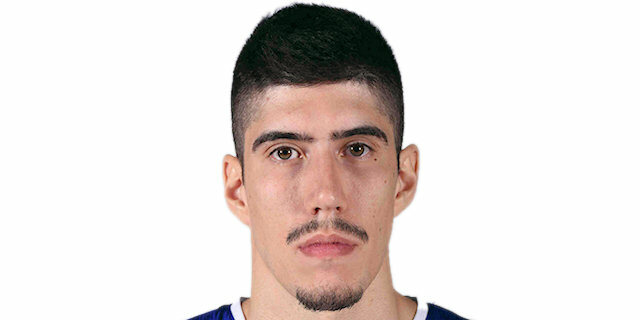 Barovic ended Buducnost’s five-minute scoring drought with a hook shot. Ivanovic’s foul-line jumper to end the third quarter made it 64-57. Danilo Nikolic started the fourth with a triple, Gordic netted two more and Ivanovic buried another as Buducnost came back to tie the game at 69-69. After 3 free throws from Forray, Danilo Nikolic made Buducnost’s fifth three-pointer in as many minutes. Gutierrez scored twice to make it 76-72 with five minutes to go. Danilo Nikolic and Shields traded threes as the game came down to the final minutes. 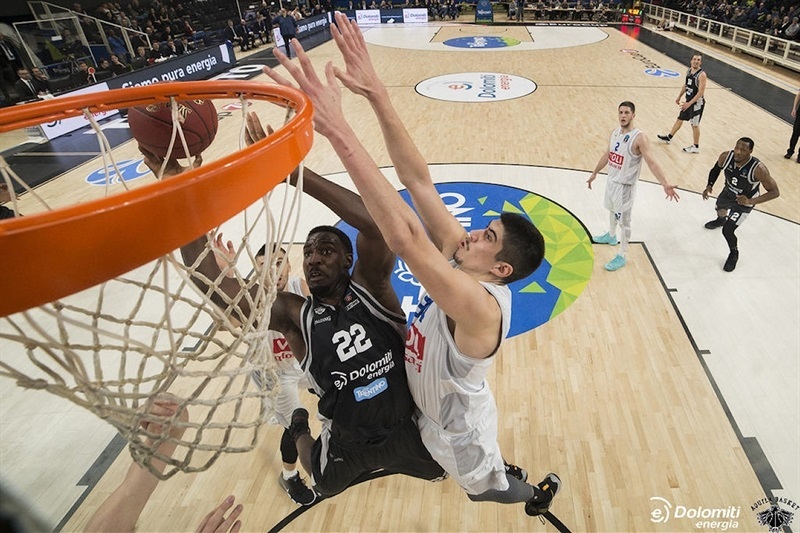 Ivanovic scored 4 points in the penultimate minute of regulation before Gordic split free throws to tie the score at 82-82 with one minute remaining. Hogue fouled out with 19.3 seconds remaining on what was ruled an unsportsmanlike foul, but Kyle Landry missed the resulting free throws and Buducnost was unable to score on the final possession, which led to overtime. Forray ignited the fans with a three-pointer to start the scoring in the extra session, but it was tied a minute later after free throws by Ivanovic and Landry. In the meantime, Gutierrez fouled out. 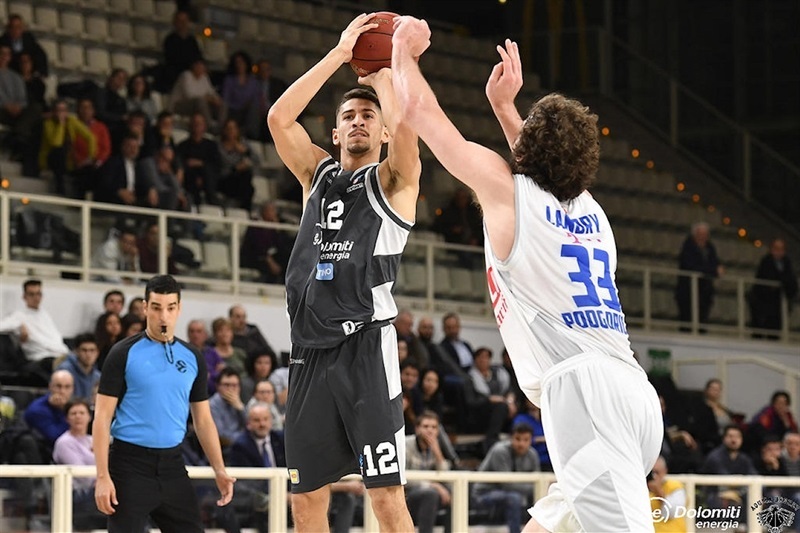 Then Ivanovic fouled out on the other end, while free throws by Forray and Diego Flaccadori made it 90-87. Forray fixed a broken play with a bank shot, but Gibson kept Buducnost in it and – after Forray fouled out – Gordic nailed a three-pointer to tie it at 94-94 with 27.6 seconds remaining. A clock malfunction in the final seconds of the first overtime cost Buducnost what appeared to be a game-winning layup and the game went into a second extra session. Suad Sehovic slit free throws to put Budocnost in front, but Gomes hit back with a triple. Suad Sehovic struck from downtown to make it 99-102 with two minutes on the clock. A tough layup from Flaccadori made it a 1-point game and Shields’s layup seemed to have won it with 1.3 seconds to go. But Gomes fouled Danilo Nikolic with 0.1 seconds on the clock and the latter hit 2 free throws to win it. "I think this game was a bit like the previous losses: we lacked consistency and toughness in key moments, we were not clear and focused. Our reaction in the second half was important, but not enough; we paid for our mistakes on offense and defense and with our decisions at the end-of-game situations. It is a pity because of the importance of this game on our chances in the EuroCup, but it is from these games that we can grow. We really need to adjust the way we approach the game; the high level of mental effort in these very long games is difficult to maintain if you lack consistency." "It was a tough game and we were preparing for a tough game because they are a tough team from top to bottom. From Forray, who played his game of the year I think, to Gutierrez, Shields. I won’t even talk about Sutton. 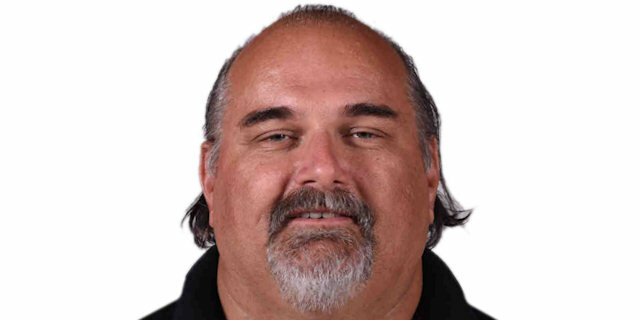 For us it’s a big win." "I don’t know what to say. It was a huge game. We played so-so, but at the end the result is most important. What can I say? This is a great win for us. The atmosphere here at the club, we have great teammates. We are like a family. When you are like that, things like this happen."